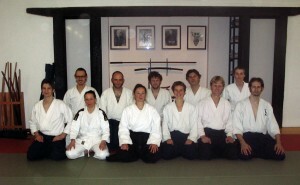 Sanshinkai Aikido Utrecht is a club with an open en respectful atmosphere. Within this we create an educational environment in which our members train with joy and enthousiasm. 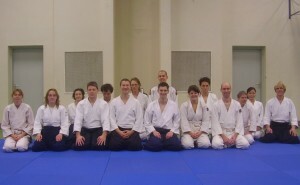 Our club has been founded on the 27th March 2007 by some people who are already practicing aikido. At that time, they had already been training different Aikido weapon techniques for almost three years at miscellaneous outdoor locations under supervision of Sander van Geloven. On the 11th of June 2008 the society became more mature by electing a board and has subsequently obtained official registration at various official organisations. we had or inaugural training with indoor lessons on the 1st of November 2008. Our goal is to provide conditions which are needed to train the Japanse martial art of Aikido according to the system of Masatomi Ikeda shihan. This system is also known as Sanshinkai Aikido and according to us aims for harmonious self-expression by developing freedom and responsability. Our Aikido lessons are in a sporthal where we have 126 m2 of our own mats. We also offer weapon lessons at green outdoor locations. This adds an extra dimension to the experience by training outside throughout the entire year in all weather conditions (with some exceptions). In April of 2010 we had our first international seminar with Jelena Vrzić, 6th dan, from Serbia which turned out to be a succes.See our homepage for an overview of past events and the left side of this website for an overview of upcoming events. We offer different lessons as can found in our training schedule. Our members interact in a friendly manner and meet each other also outside of the lessons at social gatherings. For more information or a free trial lesson, please contact us.